Serene (adj. ): calm, peaceful and untroubled. A state that most normal human beings aspire to, but in this day and age of deadlines and instant communications constantly pressing for our attention, serenity is usually something that we dream of, or hope for – soon. Always soon, not now, but soon. Right now there are just too many darn things queuing up demanding to be focussed on, fixed, looked at, resolved or attended to. Waterfront Charters have married these two concepts admirably. Our Serene Princess is a beautiful catamaran called (you guessed it) Serenity One, and she embodies all the above regal adjectives. She is also the perfect vessel to impart a serene outlook on life, which is exactly what she sets out to do on a regular basis for stressed members of society. If you want to talk calm, peaceful and troubled, picture yourself lying forward of the cabin, on a trampoline between the twin hulls of a 12 metre luxury catamaran, in the warm, comforting sun. Above you the twin sails billow gracefully in a soft offshore breeze, driving you effortlessly through the gentle Atlantic swells. In your hand, an iced-drink (whatever your choice of refreshment); off the port side lies the looming massif of the Cape Peninsula mountain range, to starboard endless miles of empty sparkling ocean. A pod of dolphins cruises past, gracefully breaking the surface with their dorsal fins, seabirds dip and glide past the mast. In your ears soft music, a perfect accompaniment to the views. Ahead of you lies your destination, Clifton Beach, one of the most beautiful sights in the world, and you’ll get to see it from the perspective of the ocean, the millionaires viewpoint. And you smile at your lovely companion and say: “Ah. Peace; perfect peace.” You have found serenity. This needn’t be a dream. Serenity One sails on a daily basis, and is there for all who need her calming services. On a technical note, she can carry up to forty passengers in absolute comfort, and as noted above, has a cabin as well as open areas to lounge around. Apart from her sailing rig, she also has twin 55 hp diesel motors, so she can handle whatever Nature throws at her. (Safety is always Waterfront Charters number one concern; Serenity is equipped with all the most modern navigation and communication equipment, with a highly trained crew and safety equipment to meet any emergency.) There is a bar – of course - with convenient seating for those who don’t wish to stray too far from refreshment. Serenity One is an amazing boat; her lines make her one of the most attractive vessels in the V&A Waterfront, and she sails as good as she looks. Whether it is a Clifton Cruise or a Champagne Sunset event, a coastal trip or a Harbour Lights experience, just being aboard Serenity is a sure-fire stress reliever. There’s more: Serenity is available for private charter too, which must be one of the most perfect ways to host an event. Private and corporate functions are perfect aboard a sailing boat: a luxurious venue that has ever-changing magical views. With a wide choice of catering options and a selection of top DJ’s on tap too, a Serenity One charter is the ideal way to impress friends, family, clients and staff. The prices are incredibly reasonable too: more cause for serenity. Our advice? “Noli illigitimi carborundum”, as Caesar certainly never said, but no doubt thought on many occasions – don’t let the bastards grind you down. 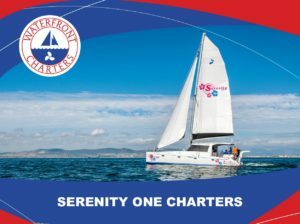 Join us regularly aboard Serenity One and find your own calm, peaceful and untroubled state far away from those pesky illigitimi. Raise the Blue Flag; Drop Anchor and Crank Up the Volume: it’s Clifton!